Death of the translator of Twenty-Thousand Leagues Beneath the Sea, Oniula, George W. Kanuha, 1876. A Solemness, an Expression of Affection for G. W. Kanuha. E holoholo kuaua paupili ana. Travelling about like the Paupili showers. George W. Kanuha was born in 1845 in the town of Kailua, North Kona, Hawaii, of the streaked sea, the peaceful sea at Kalaiaehu, ever moistened by the amazing rains of the land of his birth in the face of the clouds. And he passed on to the other side of the black river, that line before the animals life and plant life which forever moves toward the final Great Revelation in the City of heaven. On the 16th day of this month, G. W. Kanuha travelled one last time in the shade of the ulu trees of Lele [Lahaina] in the sparkling sun and the red dirt of his welcoming home, sinking into the eternal home, the belly of the earth following after papa and mama. Aloha ino. Sweet article on the 80th birthday of Pilipo Haae, 1940. The picture placed above is of one of the kamaaina of Kona of the horizon clouds in the calm, and the land famed for the Tail of the Manini [ke Pewa a o ka Manini],¹ that being Phillip Haae who just made 80 years old on the 23rd of June, A. D. 1940. Pilipo Haae was born in Kealia Kai, South Kona, Hawaii, on the 23rd of June, A. D. 1860. When he was six years old, he went to the school at Hookena, and Mr. D. H. Nahinu was his first teacher, and after him was Mr. J. E. Namaka. He went to school under this teacher for some years, and his last teacher in Kona was Mr. John Keawehawaii. They were taught in the Hawaiian language, being that during those days, O Hawaii’s Own, it was that the Hawaiian language which fully enveloped you. While John Keawehawaii served as the teacher, Haae’s classmates and he as well were graduated. This was after the conclusion of the School Testing [Hoike Kula] of all of the Government Schools of South Kona which took place at the church of Honaunau. In the month of August, the children of the Hookena school were considered for matriculation into Lahainaluna. The children were told, they being Geresoma Waiau, John Nahinu, and Phillip Haae. When he found out that he was one of the children to enter Lahainaluna School, his parents prepared what was necessary for him to go to school. When this was ready, and when the day came for his boat to leave, he got on. The Kilauea was the ship during those days. When it reached Maui, and the ship stopped there, he got off on land. When the ship got to the dock, the upperclassmen from Lahainaluna were waiting, being sent to retrieve the new children. In those days, there were no cars like today, but there were carts pulled by oxen. Their bundles and the fish boxes [? pahu I’a] were placed upon the cart, and we children who were headed to the school went up by foot. The children returning to the school came from Kau, Kona, and Kohala Loko and Kohala Waho. The children were all Hawaiian. He entered into Lahainaluna School in 1877 in the month of September, and graduated in the month of June in 1883. There were seven of them in the Senior Class [Papa Ekahi] the year that he graduated, and one of his classmates is still living here in Keaukaha, Hilo, Hawaii, and the two of them regularly get together at Keaukaha when Pilipo Haae comes to Hilo. He entered into Lahainaluna School, and the Head Instructor [Kumupoo] was Mr. H. R. Hitchcock [H. R. Hikikoki], and T. B. Hascall was the first assistant, and Rev. J. B. Hanaike was the second assistant. The children were taught in the Hawaiian language by the Hawaiian teacher, Rev. Hanaike, and sometimes they were instructed by the head teacher. Afterwards new assistant teachers came. English was taught to the students during his later days at Lahainaluna School, but it was difficult for the lips to speak, and the haole understood what was being said when spoken all garbled [paka-ke]. After he graduated, he returned to his land in the month of August, after travelling about with his classmates of “Maui, The Greatest” [Maui No E Ka Oi]. In the month of August, Phillip was assigned by Mr. H. N. Greenwell, the School Agent of North and South Kona, to work as teacher at Ala-e School. He carried out his assignment. He went to Ala’e School in September, 1883. The road to there was long; 5 miles, the roads of Pinaonao were bad; this along with the very meager pay from his school, just a $1 a day, therefore, he decided to leave the teaching job and to take on the occupation of his ancestors, that being “Farming” and “Fishing,” and so he left his teaching position in the month of May, 1886. He did all sorts of jobs. His last position he held was the Head of the Prison of Hookena, South Kona, Hawaii County, which he held for 15 years. In his marriage to his wife, they lived together for 38 years, and it was the death of his wife which separated the two of them. Betwixt them, their family garden bore fruit with boys and girls, and from them they have many grandchildren almost reaching seventy. On this past 23rd of June, his 80th birthday was celebrated. He remains active as ever, and he is very good at numbers [makaukau loa ma na huahelu], and is pleasant to talk to, and is full of funny things to say. We pray as well that he is given more birthdays to come. ¹A reference to the bay, Kapewaokamanini in Kona. ²Kahulaleaokeakealani, daughter of S. M. Paauhau was born on June 14, 1867 and died June 7, 1922. Ka Hoku o Hawaii, Volume XXXV, Number 22, Aoao 2. Sepatemaba 25, 1940. The Hon. J. A. Nahaku passes on, 1887. The Hon. J. A. Nahaku. In the deep purple morning of this past Thursday, the 24th of this past month, at Honuakaha, here in Honolulu, the Almighty Father was pleased to take the last breath of our dearly beloved father, and leave him behind to sleep the eternal sleep at his last home in Makiki. And left behind were tears of grief on this side of the grave. And he passed after being troubled with sickness for the long period of seven years. The Hon. John Nahaku was born at Mahukona, Kohala, Hawaii, on the 18th of September, 1830, from the loins of Kaoiokalani (f) and Namaka (m) and until his recent passing, he was aged 56 years, 5 months, and 6 days. J. A. Nahaku was educated at the district school of Kohala, and in the year 1850, he entered into the school of Rev. E. Bond, at Iole, and in 1852, he entered into the Hilo Boarding School, and in 1854, he entered into Lahainaluna College under the tutelage of W. P. Alexander, and in 1857, he graduated from Lahainaluna and returned to Kaanapali where he married his wife, Mrs. Ruth Keliiokahekili, and there he resided and in 1860 he was appointed Sheriff of Kaanapali. In 1864, he was elected as a Delegate to the Constitutional Convention. And in 1866, he was elected as the Representative for the district of Kaanapali, and in 1868, he was reelected, and in 1870 he was appointed as census taker [Luna helu] for the district of Molokai and Lanai. In 1875, he was appointed as Census taker for the district of Lahaina, and in 1876 he was elected as Representative for the district of Kaanapali, and in the same year he was chosen as Tax Assessor for the district of Makawao. He served again as Tax Assessor for Makawao in 1857—75—and in 1879, he was chosen as Tax Assessor for the districts of Molokai and Lanai. In 1880, he was reelected as Representative for the district of Kaanapali, and that was his last term in the Legislature. In 1881, he was selected as assistant Judge [hope Lunakanawai] for the district of Lahaina, as an assistant to D. Kamaiopili. In 1882, he was chosen as secretary for the Board of Genealogy of Hawaiian Chiefs [Papa Mookuauhau o na Alii Hanau o Hawaii nei], and it while serving at this post that he passed on. In 1883, he was chosen as Tax Assessor for the district of Lahaina, and this was the last year which he filled a government post. As a Lawyer, he began serving as a full Attorney in the year 1866, until that day mentioned above, when he left behind all the work of this life. J. A. Nahaku was a greatly trusted man by his friends, and he was highly prized by our greatly loved King, and he was a friend to everyone all around Maui. He was a loving father, he was kind, welcoming, he recognized the great and the small, and his friends most likely shall not forget him. He was a tireless father to us children, and his grandchildren, and so too to all of his family; he never grew weary of us, even if weakness constantly attacked [?? hooiao ?? hoohao] his body, and thus he persevered the hardships of this life until he passed on. Ka Nupepa Kuokoa, Buke XXVI, Helu 10, Aoao 3. Maraki 5, 1887. Schools in Hawaii nei, 1844. II. The Schools. Lahainaluna College: there were 135 students enrolled in the school just recently. Six of them are studying the apostles of God with Dibela [Dibble]. In April, 30 students graduated, four died, three went home because of illness, and three were expelled for rule violations; that leaves 97 remaining at the school. They are being taught by three teachers, Dibble, Emesona [Emerson], and Alekanedero [Alexander], in penmanship, in music, math, geography, algebra, surveying, theology, philosophy, composition, and speech. Some study in English, others study in the word of God. College at Wailuku. The teachers at the school are Bele me kana wahine [Mr. and Mrs. Bailey] and Mi. Okana [Miss Ogden]; there are 47 students living there and eight are married. At the school is taught reading, penmanship, geography, math, philosophy, theology, spirituality and actual work. Boarding School at Hilo. Laimana laua me kana wahine [Lyman and his wife] are the teachers. There are sixty students at the school; 37 of them have become members in the church. The instruction is like that of the Colleges at Wailuku and Lahainaluna; however they are not progressing far in the difficult subjects like at Lahainaluna. Girls’ School at Hilo. Koanawahine [Mrs. Coan] is the teacher; most of the food is donated by the church members in Hilo. There are 26 students; there of them are married to husbands, 21 of them have joined the church. Boarding School of the Alii. Kuke laua me kana wahine [Cooke and his wife] are the teachers. They are instructed only in the English language. The government sponsors this school, and supplies all necessities. It is doing well currently: the students are obedient and are progressing in their knowledge. Missionary School at Punahou. Dola [Dole] and Kamika wahine [Mrs. Smith] and Rise laua me kana wahine [Rice and wife] are the teachers. There are 24 students at the school. This school is solely for the American missionaries. Select Schools. There is one in Waioli under Ioane [Johnson]. There are 63 students. It is not a boarding school. The students put effort into working, and it is from this that they get their supplies, and the church members give assistance as well. In Hilo is another select school. There are 70 students, and Wilikoke [Wilcox] is the teacher. But he might have gone to Waialua to live. In Kohala is another. Bona [Bond] is the teacher; there are 12 students; there is schooling for teachers there also. There is a select school at Hana. Rice was the teacher, but he has returned to Punahou now. There were recently 30 students. Small Schools. In these Islands there are 330 schools; 270 teachers; 12,762 students; 4,000 children can read, 2,100 can write; 5,800 can do math; 1,850 know geography. [The state of the schools in Hawaii nei was part of what was discussed at a missionary conference held in 1844. This description starts with “II.” because i left the first part of the discussion out which was “I. Pertaining to the Church“. Ka Nonanona, Buke 4, Pepa 6, Aoao 35. Iulai 9, 1844. Ka Nonanona, Buke 4, Pepa 6, Aoao 36. Iulai 9, 1844. Looking back at their time spent at Lahainaluna, 1904. TEARS SHED FOR THE DAYS GONE BY. Being that some of the old students educated at Lahainaluna College are involved in this water rights case, Mr. McDonald, the principal of Lahainaluna, gave a small party for the old students of the school. Amongst those who attended were the Hon. J. L. Kaulukou, T. He-u, students who graduated in 1854; D. Kailua, a student who gradutated in 1858; Hon. D. Damiana, a student who graduated in 1857; Mrs. E. M. Nakuina, from the side of the Government; and some other people. After the stomachs were filled, the graduates were called up to talk about their life at the school, and as a result of the words of these people, much tears were shed because of the great troubles faced in search of education in those days gone by. According to one of the graduates, his clothes in those days of hardship was just two pants, two palaka, a hat, and no shoes. Another said that he had just one shirt and no other, none at all. Being that there was much food planted on the school property by the students, fish was the relish, the oopu that were caught in the rivers, and the luau. Ka Nupepa Kuokoa, Buke XLII, Helu 20, Aoao 5. Mei 13, 1904. 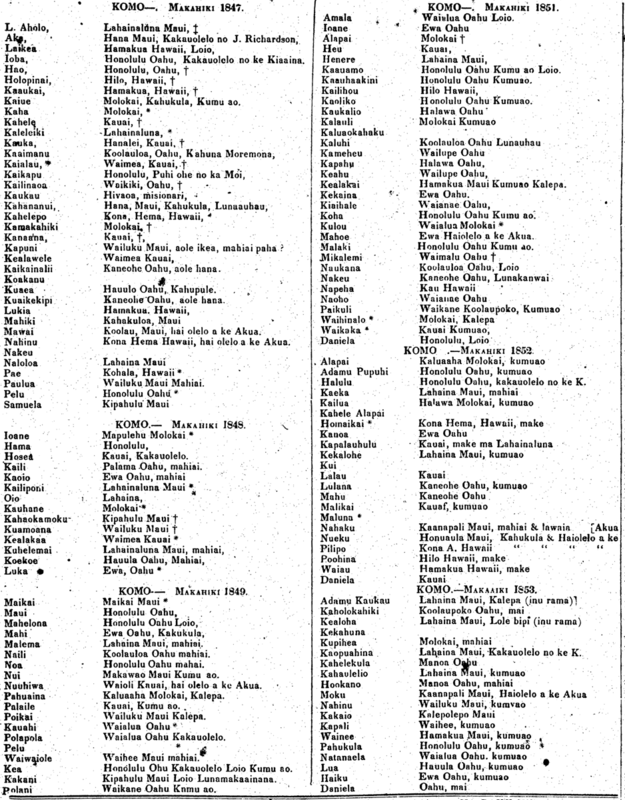 Lahainaluna student roster, continued, 1858. Ka Ipu Kukui Pio Ole i ka Makani Kauaula! 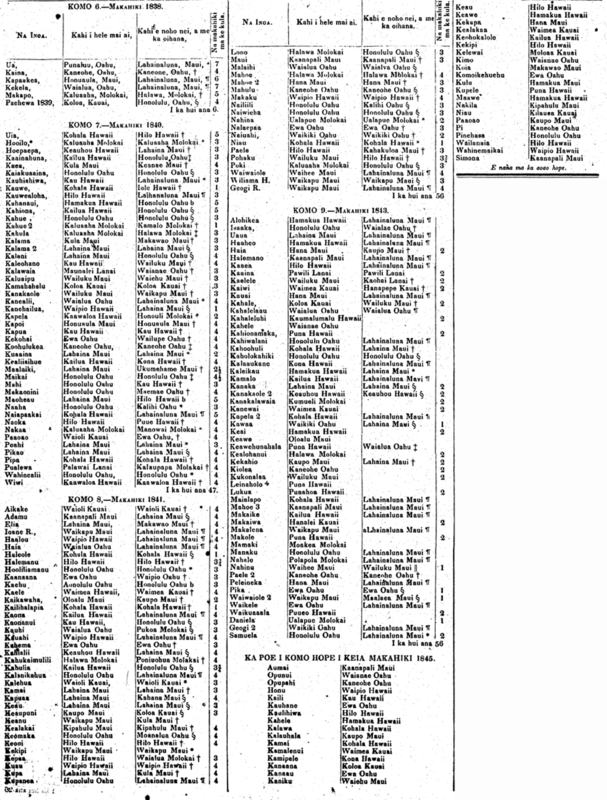 This is the continuation of the previous post, showing the students who entered Lahainaluna by year, where they came from, and where they moved to after leaving. It also shows how long they stayed, and what they were doing since leaving the school. Ka Hae Hawaii, Buke 3, Ano Hou.—Helu 7, Aoao 27. Mei 19, 1858. Ka Hae Hawaii, Buke 3, Ano Hou.—Helu 7, Aoao 28. Mei 19, 1858. There are earlier rosters as well in Kumu Hawaii. “He Papainoa no na Kahu a me na Kumu a me na Haumana o ke Kulanui o Hawaii Nei, Ma Lahainaluna i Maui.” Augate 19, 1835, p. 132. “Ka Papainoa o na Kahu, a me na Kumu, a me na Haumana, o ke Kulanui o Hawaii nei, ma Lahainaluna i Maui. 1835.” Dekemaba 9, 1835, pp. 195–196. 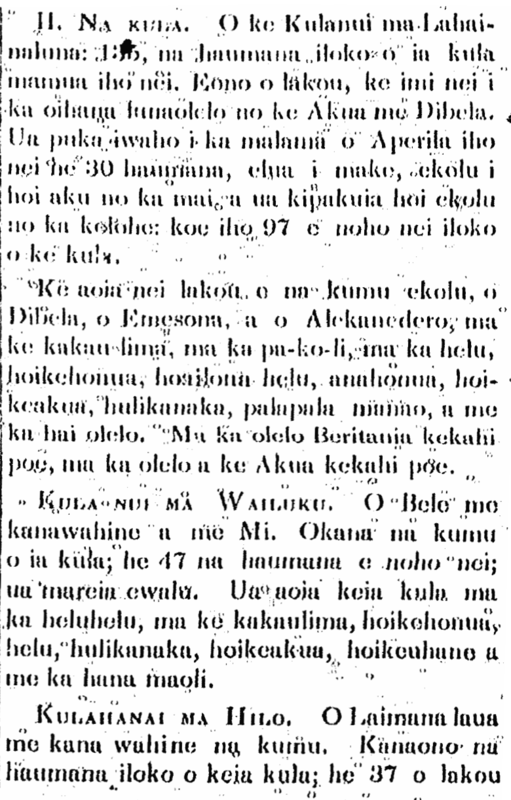 “He Papainoa no na Kahu, a me na Kumu, a me na Haumana o ke Kulanui o Hawaii nei, ma Lahainaluna i Maui, 1836.” Feberuari 15, 1837, p. 76.